← Where is the Muslim Rage? Is Priest Who Inspired Video Worth All The Rage? As more details have come out about the men behind the anti-Islam video that enraged parts of the Muslim world, it was disclosed that they are devotees of Zakaria Boutros, a fiery priest who for years has been on a mission to discredit Islam and its Prophet Muhammad. What makes Boutros unique is his approach? The 77-year-old Egyptian did not just study Christian theology; he claims that has devoted his life to studying Islam, the Quran, Muhammad’s sayings and Islamic jurisprudence. He has researched both medieval and contemporary Islamic texts, and he has done this all with the aim of finding “alleged” inconsistencies and exposing what he believes to be a “fake” religion. This entry was posted in Uncategorized and tagged Islam, zakaria boutros. Bookmark the permalink. 3 Responses to Is Priest Who Inspired Video Worth All The Rage? – What I call Fr Zakaria Boutros phenomenon is indeed intriguing. We may or may not agree with what he is doing on the basis that his criticism of Islam, both political and non-political, does not help the Coptic cause; however, he remains a very influential personality, both amongst Christians and Muslims. I personally would like Copts to do politics and understand how the world works, and what makes us able to win the heart and mind of the modern man, rather than embark on religious debates that are never ending. – To understand the phenomenon of Fr Zakaria Boutros, one has to understand the plight of the Copts, and Fr Zakaria’s personal and family history, first. The Copts have been oppressed by Islamists for quite a long time. The non-remitting persecution, terrorism and daily insults in Egypt have created a bitter, defiant mood in the Copts. When they found the freedom they were denied in Egypt, after some of them moved to the West, they used that freedom to respond to the constant assault by the Islamists – a freedom which is limited to speech only by rebutting Muslim criticism of Christianity and then criticising Islam itself, using Muslim sacred literature itself, whether Koran, Hadith, biography of Muhammad, or books authored by Muslim scholars. – Nearly every Copt in Egypt has come face to face with the kind of oppression and persecution we have spoken of; and Fr Zakaria Boutros has personally experienced the worst of it: his brother was beheaded in front of him in Upper Egypt by Islamists. One has to take this into account: a personal intense experience of violence by Islamists that was undertaken by them in the name of Islam, and inspired by certain Islamic texts or their interpretation. 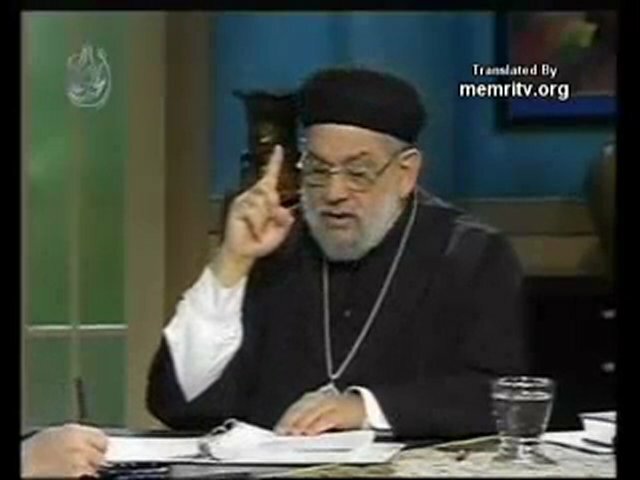 – It is coincidental that Fr Zakaria Boutros has recently been interviewed by MRCTV: I post the link of the interview: http://www.mrctv.org/videos/michael-coren-father-boutros-islamic-persecution-and-innocence-muslims and I am doing that so as we all try to understand this phenomenon and see what has led to it. The root cause of the phenomenon is the increasing Islamisation of the society in Egypt’s modern history, particularly since Sadat succeeded Nasser in 1970. Thank you so much for this interesting comment. As always, I appreciate your contribution.